There are as many different types of memory quilts as there are occasions and individual memories. Whether you are a beginning quilter or have years of experience, you can make one of this cherished quilts for yourself or for a gift. Memory quilts are wonderful ways to remember important life experiences. There are lots of great memory quilt styles to try. Signature quilts, also called friendship quilts, are usually made from quilt squares that have been signed by the guests at an event. The squares can be pieced or plain and made from almost any design that allows the signature to show. They can also be made by having each person make a pieced quilt square and signing it. This will work best in a small gathering so that you are not working with too many quilt squares. You can create photo quilts by scanning favorite photos into your computer and printing them out on special paper. You can then iron the photos onto fabric and use this to make a quilt full of memories. Like your great-grandmother before you, when your clothes get worn out, you can cut them into pieces and make scrap quilts out of them. Not only are you recycling cast-off clothing into something useable; you are also preserving your memories. In this day and age, it can seem a little wasteful to cut up perfectly good clothes when you could donate them to charity. So if you have clothes that are unstained, don't have holes in them and still look wearable, go ahead and donate them. But you know you've got some clothes that simply aren't fit to give away: that blouse with the coffee stain, the T-shirt with sweat rings, jeans with holes. Think of those lost pieces of clothing as fabric opportunities. Go through your closet, laundry basket, and donation pile to find these clothes that aren't worth wearing or donating. Cut off the unusable parts and see what you're left with. Scrap quilts work best with a pattern made up of small pieces of fabric, since the clothing will yield a variety of shapes and sizes. A necktie quilt can be a great Father's Day or Christmas gift for the man in your life. This is an especially fun quilt to make as a retirement gift for the man who has worn suits his entire career. You can also find ties at garage sales, thrift shops, or even the husband's closet; just don't take ties that he still likes. Another great idea for a keepsake quilt is to make a quilt out of old blue jeans. You'll need a pretty powerful sewing machine and a fresh needle for this project. Take all your family's jeans that have holes or don't fit anyone. Cut off the seams. 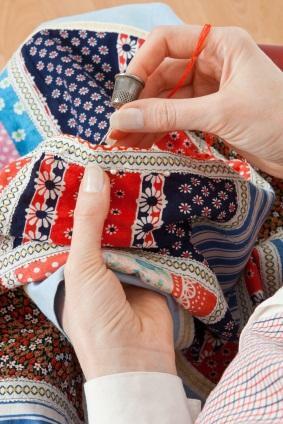 You can either leave the pockets (which can be used as pockets on the quilt) or use a seam ripper to carefully take the pockets off. You will still be able to see where the pocket was, but it's pretty cute. Or just discard that part of the jeans or use the pockets in another project. Leave the legs in strips or cut everything into squares and stitch it together. The different colors of denim will make a lovely patchwork. Denim is heavy, so you could probably go without a thick batting in a quilt like this. Use flannel or something soft for the backing, and tie the top of the quilt rather than topstitching unless you have a very powerful machine. If you are an experienced quilter, you may want to try some intricate patterns like this Cathedral Window quilt made from blue jeans. The quickest and easiest keepsake quilt you can make is a T-shirt quilt. Everyone has old T-shirts with logos on them that hold special memories. You might not be able to wear them anymore because they are small or stained, but you can't bear to part with them because of the memories they conjure. Instead of tossing that pile of memories or keeping it in a drawer forever, make a T-shirt quilt. Just collect your T-shirts, find the one with the biggest logo, measure the logo (plus some space around it for seam allowances and such), and then make all your blocks around that size. You can put borders between the rows of shirts or just leave it all shirts. Back this quilt with a jersey fabric, and it will feel like being wrapped up in your favorite T-shirt when you use this quilt. Make sure you tell your kids the stories behind the T-shirts. And remember that T-shirt quilts are great for kids, too. They like being able to keep some of their favorite clothes and to have a fun (and machine washable) keepsake quilt. Once you have made your first memory quilt, you will probably look for reasons to make more. Memory quilts are as much fun to make as they are to give away. After all, the materials are often inexpensive and the rewards are great.